The past few weeks have proved informative at Winthrop! 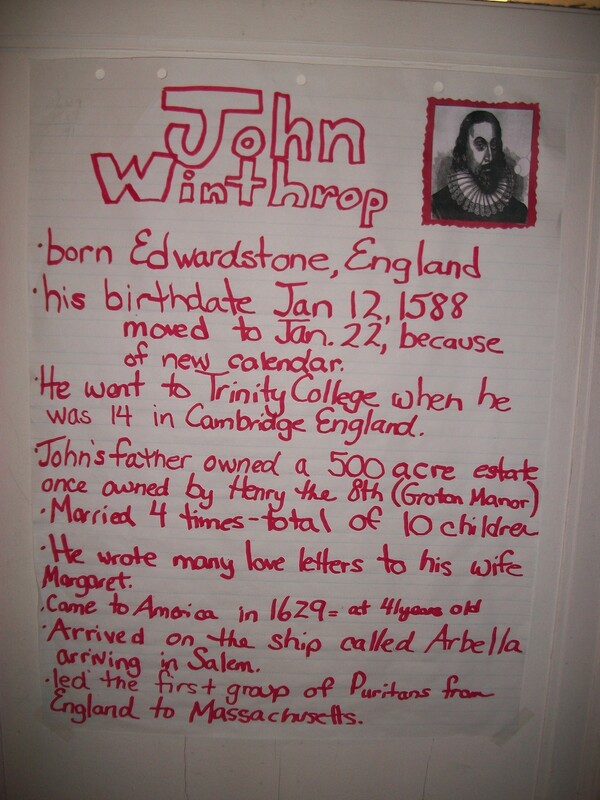 Many students and classrooms participated in our “All-School Challenge” and learned about our namesake, John Winthrop. Students were captivated by the amount of wives and children he had, but many also brought forth the political and religious reasons why he was an important figure in Massachusetts history. 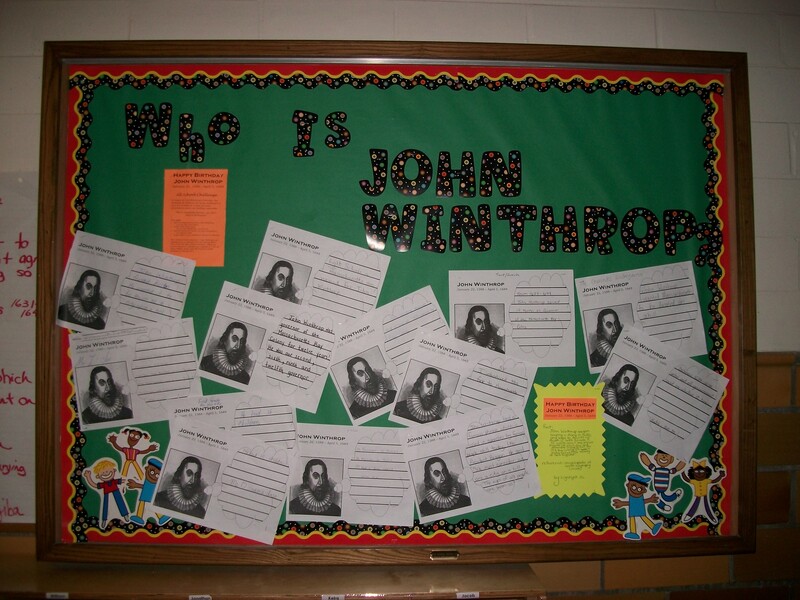 The pictures show the main hallway bulletin board, a sample of the wealth of information found by Mrs. Ogiba’s class (they actually needed two sheets of chart paper), and the diligent work of a Winthrop fifth grader. Our canvas portrait of John Winthrop – a gift from the class of 2004 – has found a new home in the main hallway and presides over our building as a true namesake! It’s hard to believe that the Winthrop Science Fair is almost here! I can’t wait to see all the students theories and hard work put to the test on Wednesday, February 29, 2012. Last week, Mrs. Sikkema sent an important reminder notice to all participating families – see the link below for a PDF copy. 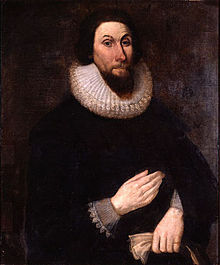 In honor of John Winthrop’s 424th birthday I’ve challenged all students to do a bit of research this weekend to learn more about our school namesake! Mrs. Z’s and Ms. Mazzei’s kindergarten classes got a jump-start and kicked off the challenge last night, and were our resident experts today! This is an optional task for students, but as a school community next week we’ll be collecting facts, sharing with other classes and grades, and creating a public display of all we’ve learned. All students were given a bright orange reminder sheet (white handout in K) outlining the parameters. 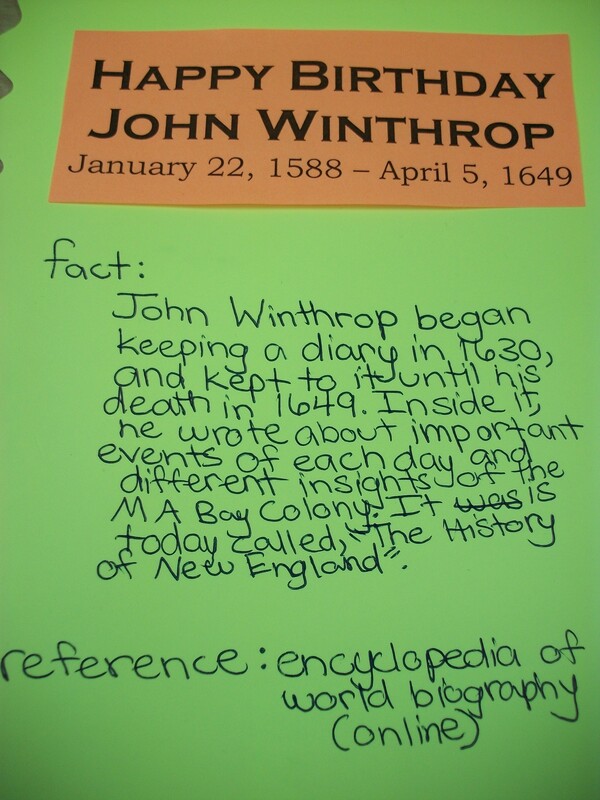 Students in grades 3, 4, and 5 were asked to show responsibility and maturity in leaving the easy facts for our primary students, and truly researching unique, detailed, information about Governor Winthrop. I know they’ll impress us!